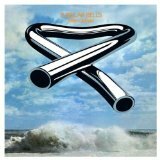 "It's hard to hold the hand of anyone, Who is reaching for the sky just to surrender"
Tubular Bells (this album) (1973). Related links: top tracks by Mike Oldfieldtop tracks of the 1970s, top tracks of 1973. The song is very good, starting with the Exorcist tune and progressing with some calmer and harder moments, but when you get to the end and start that sort of fugue with the instruments being introduced, all played by him... really really cool. Always loved this. This first side is far superior to the second. A great musical journey. These kinds of long instrumental progressive songs usually end up being kinda hit and miss with me. There's always that one part that's really good and then those other few parts that you'd rather not listen to again, but just the ability to write such a long song is incredible. All that being said, the music playing at the end when the guy is announcing all the instruments is so beautiful. It's one of the coolest melodies I've ever heard.